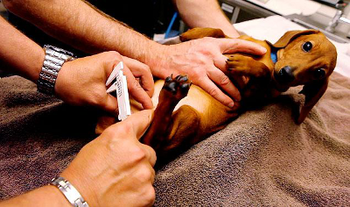 A new procedure called Zeuterin offers an alternative to the standard method of neutering male dogs. It’s a non-surgical, chemical treatment that calls for the injection of a zinc gluconate solution into the testicles. The chemical reaction that occurs sterilizes a male dog by destroying already-present sperm and creating scar tissue throughout the tubes that sperm use to travel during reproduction. The injection is about as non-invasive as possible, consisting of a single injection into each testicle. The ramifications of this innovation are huge: it could be healthier for our pets because they don’t have to undergo the rigors of surgery or anesthesia, which eases both physical and psychological stressors. It also holds the potential of an affordable means of quickly and easily sterilizing shelter animals, as well as still allowing the testes to produce hormones at about half the rate of an untreated dog (old-fashioned castration obliterates any hormone production). Beyond those benefits, and because Zeuterin leaves the testicles of the animal intact, it also allows responsible dog owners and breeders to compete in the show ring with an animal that might meet conformation standards but otherwise not be ideal for breeding. While developing a bloodline of dogs is one goal of breeders in conformation competitions, at all but the highest levels it can also be a fun event for even casual dog owners not interested in the demands of breeding. Weekend events take place across the nation, but surgeries that change the appearance of the dog, which often includes neutering, are usually forbidden. For the casual dog owner that would like to compete in these events, but believes their dog should be sterilized for whatever reason – be it genetic issues as a carrier/affected dog or just to ensure an "oops" litter doesn’t happen – the new treatment is seemingly a viable option that allows them to do both.